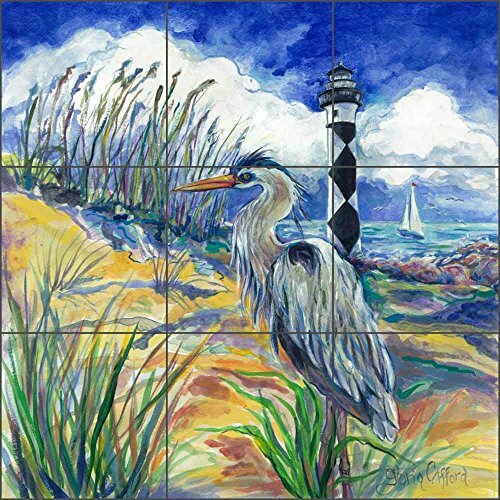 Features the artwork Blue Heron at Cape Lookout by Gloria Clifford. Turn a plain space into an unbelievable focal point with one of these Fine Art tile murals. Produced on our high quality ceramic tiles, which have a satin surface. The artwork is infused into the tile and will not rub off. Suitable for interior use only. Great for a backsplash, behind a stove, in a shower, or other interior spaces. Install using standard tile adhesive and grout. Easy to follow installation guidelines included. Also available on glass and tumbled marble, and floor tiles. NOT rated for floors, countertops, or other high abrasion locations. If you have any questions about this product by Artwork On Tile, contact us by completing and submitting the form below. If you are looking for a specif part number, please include it with your message.